Hello Everyone! It is the 60th Anniversary of our Reunion and we have added 2 extra days to allow more opportunity for people to attend. It will be here before you know it! Registration is now open! The excitement and enthusiasm that comes with the Reunion is certainly something you should experience if you haven’t been able to attend previously. And this year will be no exception. We have been so blessed as a club to hold our reunion at such a wonderful location. The Wynkoop Airport provides possibly the best backdrop that a gathering of antique airplanes could ever have. The Reunion pages are being updated as new details are finalized. Check back often to see what is new. Please use the electronic registration form to register for the Reunion to help us plan the event. We really need that help so that we can provide you with the best possible experience. If you prefer paper then use the one posted here or in the newsletter. Last year’s reunion was another spectacular event and now it is time to start planning for this year’s reunion. I hope that everyone is making plans to join us at the 60th Annual Reunion. Remember that this event is for you the member, your families and friends, and of course, the airplanes. We hope that you will plan on joining us for all of the fun at the National Waco Club Reunion in Mt. Vernon, Ohio this June. If you think that you will make it to the reunion, consider reserving a room now as you can always cancel. Rooms always fill up fast! Click on the “hotels” link for a list of accommodations. Please review all of the associated pages regarding our Reunion. A lot of people are putting an enormous amount of work into making all the necessary arrangements. The results and corresponding information can be found on these pages. By reviewing everything there you can find the answers to most of your questions. If you do have any remaining questions after reviewing these pages feel free to contact me. My contact information is listed at the end of this page. Please take note, for this big 60th Reunion, we are reserving all on-field aircraft parking for Wacos. Unfortunately there is not enough room on the field for non-Waco aircraft. 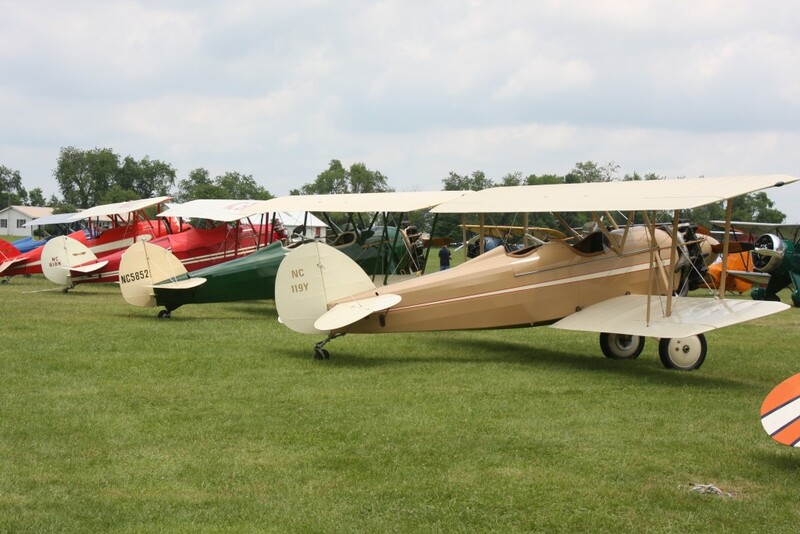 Members and non-members who wish to attend flying a different aircraft should consider landing at Knox County Airport. There may be ground transportation available from there to Wynkoop and there are no ramp or overnight fees. Check with them in advance. Note: Dinners are available now for purchase at a discount. If you wish to be guaranteed a place at these events please purchase your tickets now. The purchase is non-refundable should you not go to the event purchased as the club has financial obligations to meet with regards to these events. If you do wish to purchase your tickets now just go to the purchase tickets tab and fill in the blanks and use PayPal. Another way to purchase your tickets would be to fill out the paper order form, on this site or in the Newsletter, and enclose a check made out to the National Waco Club for the amount due and mail it to the address listed on the form. A limited number of dinners will be available for sale at the Reunion for an additional $10.00 each. Physical tickets are no longer handed out. There is a check-in table at each of the dinners where your name will be checked off when you arrive at the dinner. Come see plenty of Wacos at the NWC Reunion. Even if you do not want to purchase dinners at this time, but are planning to attend the reunion we ask that you take just a few moments of your time to register. All information received from the registrations are important to our planning. Use the online Reunion Registration or use the paper copy, on this site or in the newsletter and register early. If you have any questions please call or or email me, Doug Parsons (hangar21a@yahoo.com) at 330-284-1936 for more information. We strongly encourage you to print out the informational pages from the website to take with you on your flight to Mt. Vernon. If you want to become a member – click here!